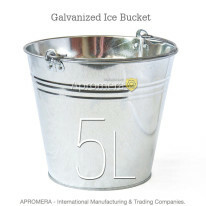 The Apromera fabrication produces small Galvanised Metal Buckets (Pails) 5l, 7l, 10l, 15l with handles wholesale in UK (Britain, London). This is a product that will please you with its quality. Whatever you choose, you can be sure of its heavy duty and excellent performance! Our goods are sure to help at home, at the cottage or on vacation. All products subject to certification have the necessary documents and meet the quality standards. Choose and buy reliable, proven products! An excellent quality / price ratio will become a nice bonus! 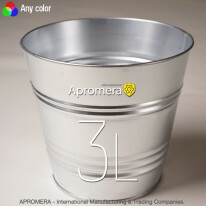 Small Galvanised Buckets (Pails) 5L with handles are made from cold-rolled steel sheet 0.4-0.5 mm-thick and are covered with zinc. Some items are painted or covered with a bright print on the outside, which gives extra protection from rust and makes the product aesthetically attractive. They come in handy at home, in the country, in construction and during repairs. They are easy, well-cleaned and resistant to corrosion unlike metal ones. 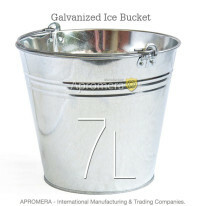 It is possible to store fruit, bulk food, water, prepare various mixtures. They are virtually irreplaceable in everyday life! 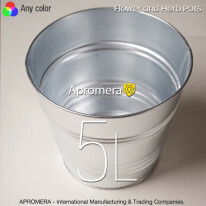 The production manufactured at our plant and presented in the wholesale catalog has a different purpose, and therefore, a different material density. 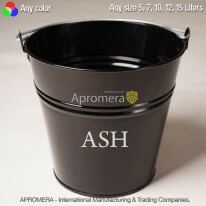 For example, a pail made from thin metal is intended for bulk products, the one made from thick metal – for mortars, paint compositions and water. They may have one or two handles. 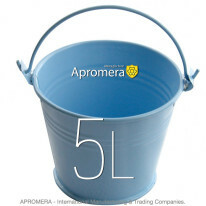 If the handle is plastic, you can load the bucket, it can be used to carry light solids, water. 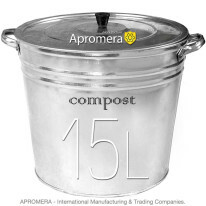 For construction mixtures it is better to choose a container with a metal handle (diameter 5mm), as it will not break under heavy weight. 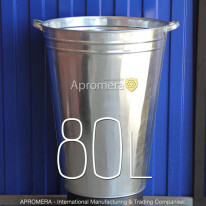 Firstly, we must pay attention to the amount that can range from 8 to 90 liters. For domestic use, for example, for water, berries, fruits and vegetables, a sufficient tank volume is 8-10 liters. For filling mortars you need a larger container for several tens of liters, this will enable you not to mix the solution too often, and get immediately the required amount of mixture of right consistency. Choose a form according to the purpose of buying. Products of a cylindrical shape are suitable for food storage, as well as for mixing a building mortar. 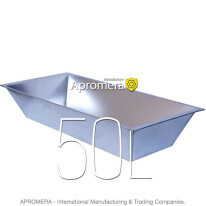 You can buy the production of cylindrical shape manufactured at our plant in bulk from our catalogue. Location: London / Britain (UK) All special features and price given on the flypage .